We start training and preparing our staff for our busy spring season in January! 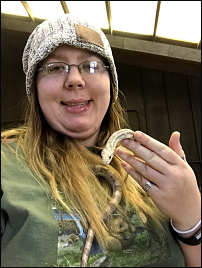 Meet Korey, another of our newest Teaching Naturalists. Hi! My name is Korey Dobbert and I’m a Teaching Naturalist with Upham Woods. I am a 2018 graduate of the University of Wisconsin-Steven Point with a Bachelor of Science in Environmental Education and Interpretation with a minor in History. I grow up in Weyauwega where my love for the outdoors was first ignited and fostered. As a kid my sister and I were outside playing with the neighborhood kids or family as much as possible. We would participate in many different outdoor actives from fishing and boating to hiking, to snowmobiling and much more. My love of animals was something I also had from an early age whether they be pets or wild. Even as I kid, I loved learning about the various kinds of animals and how they survived. Once I reached high school and beyond, I began to foster a love of working with children, which has led me on the path I am on now.